Guinea pigs make great pets for kids. They’re affectionate and gentle and a great way for kids to learn about caring for pets. Below are some tips to get you started on the perfect environment and lifestyle for your new cuddly playmate. Guinea pigs don’t require much; they need a large cage with room to roam. There are ones you can purchase in the store, but you might also consider a playpen or something similarly sized as an alternative. Even if this isn’t their main “home” it could be used as an option for your piggy to get some exercise. You’ll also want to purchase a water bottle and water bowl (the bottle is a backup in case their water bowl gets dirty), food bowls, and bedding. Shredded paper is a good option for bedding, but there are others available as well like pine shavings; do NOT use cedar as it isn’t good for your guinea pig. You’ll also want to purchase or create a “hidey” spot for your pet and get some chew toys. Guinea pigs like to hunt for things, so appropriate toys in which you can hide food treats are a good option. Their bedding will need to be changed each day. Guinea pigs need pellets made from Timothy grass, some grass hay to munch on, and fresh veggies once or twice a week. You can also sometimes give them a bit of fruit, like mango. You’ll also want to provide Vitamin C supplements because guinea pigs can’t make their own like humans do. Guinea pigs’ nails need to be trimmed once a month. You can have your vet show you how to do this at home, or you can take your pet in once a month for the trimming. You’ll also want to brush them – how often depends on if they’re short or long-haired. The more hair they have, the more frequently they need to be brushed. Remember that your guinea pig can’t jump, so if you’re playing with him on a bed or high surface, make sure he can’t fall off. 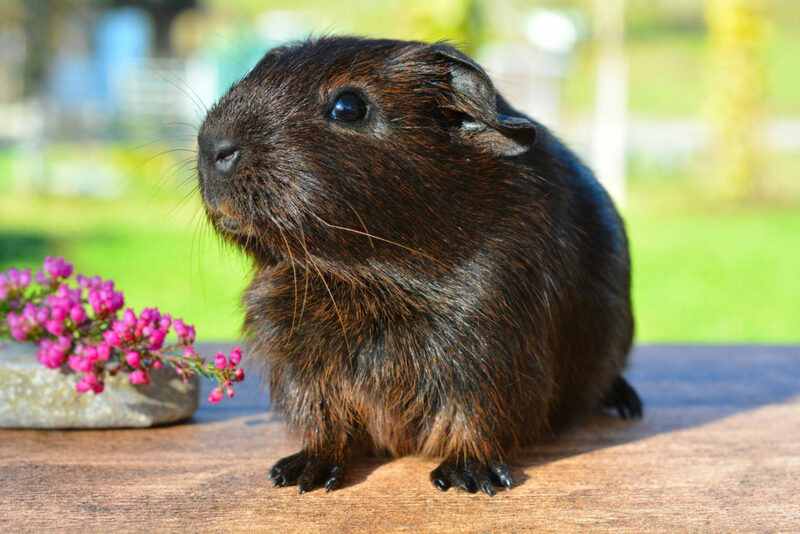 Guinea pigs love to run and roam around, but if you’re letting them do this freely in the house, make sure they aren’t chewing on electric wires or anything else hazardous to them. Finally, remember to read up on articles about Guinea pigs and enjoy your new, cuddly friend!